MPEG TS Utils solution provides a structural representation of a multiplexed MPEG-2 Transport Streams, compliant with the ISO/IEC 13818-1 specification, and DVB Streams, compliant with the ETSI EN 300 468. The application allows the user to investigate the basic transport stream and DVB packets with their fields. 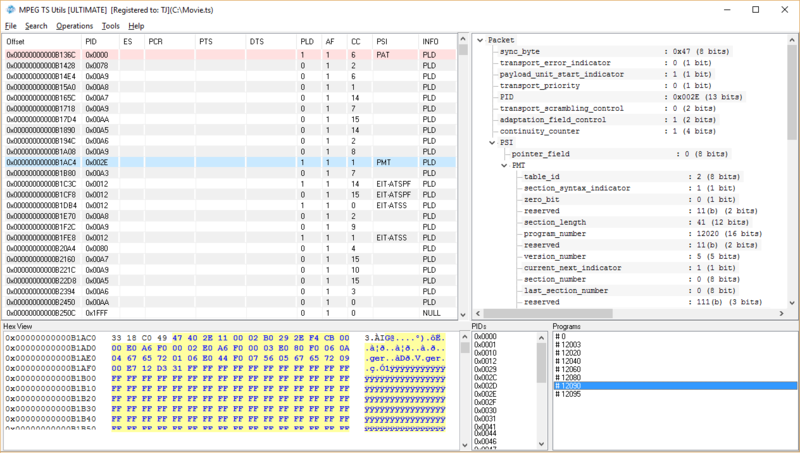 The application also allows the user to manipulate with transport streams by filtering specified PIDs and exporting to file, demultiplexing to PES and ES streams, converting multi-program TS to single-program TS. MPEG TS Utils can also perform MPEG-2 Transport stream validation according to the ISO/IEC 13818-1 specification. MPEG TS Utils Pro offers MPEG Transport Stream files verification and validation according to the ISO/IEC 13818-1 standard. 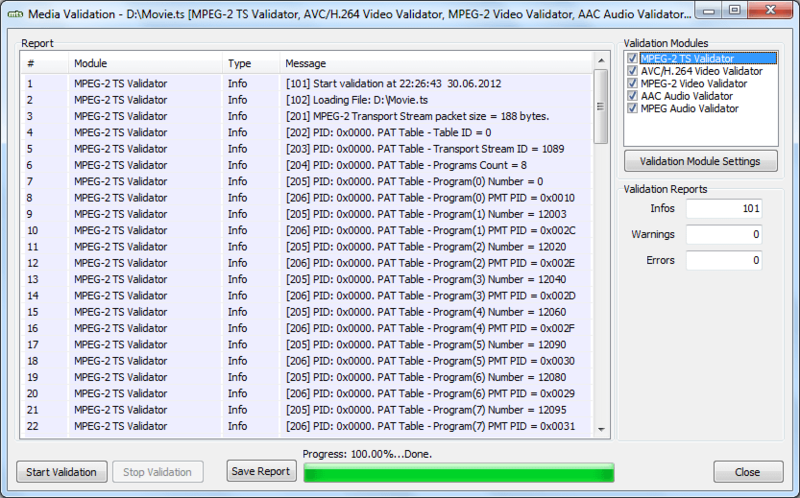 The currently loaded file in the MPEG TS Utils Pro can be validated by selecting “Validation” from the “Tools” menu. MPEG TS Utils Ultimate is a product extension of the MPEG TS Utils Pro. Along with the standard functionality of MPEG TS Utils Pro, the extended product includes AVC/H.264 Video Validation, MPEG-2 Video Validation, AAC Audio Validation and MPEG Audio Validation Modules, which now enables not only the container validation but also the audio and video elementary streams validation. The elementary streams validation process is performed by on-the-fly demultiplexing and verifyication of all audio and video elementary streams subsequently. The currently loaded file in the MPEG TS Utils Ultimate can be validated by selecting “Validation” from the “Tools” menu. Apart from the manual MPEG Transport Stream, AVC.H264 Video, MPEG-2 Video, AAC Audio and MPEG Audio media validation provided in the MPEG TS Utils Ultimate solution, Jongbel Media Solutions also provides automated media validation of the specified media formats in its Media Validator solution. Not sure how MPEG TS Utils will work for you? All container errors, such as mandatory MPEG Transport Stream packets absence, incorrect container structure or invalid header values, pointed as mandatory in the corresponding specification are output as Error Report. All container irregularities, which are not pointed as mandatory in the corresponding specification, but have unusual content are output as Warning Reports. Additionally there is a set of Informational Reports, which deliver more detailed information about the file being examined, such as programs details, elementary stream format, media duration, etc. 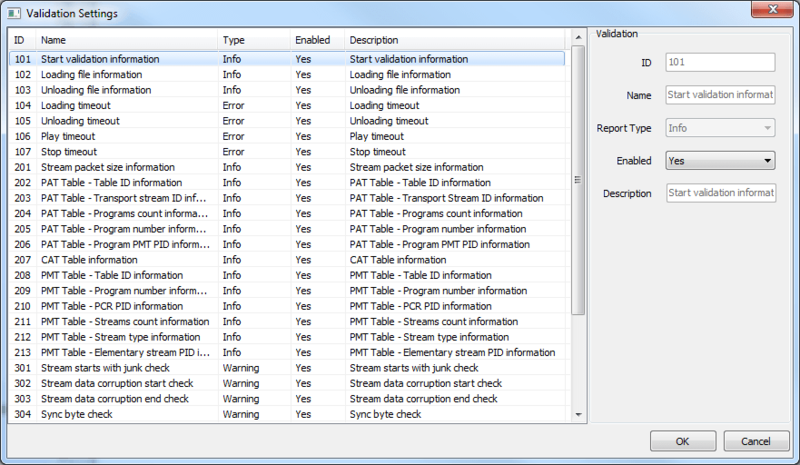 Each MPEG Transport Stream container check can be disabled or enabled or set to another report type, such as Info, Warning or Error. The solution can be applied in wide variety of workflows and with many container format deviations due to its flexibility and customization ability. For detailed validation check list follow the MPEG TS Utils documentation.